Here are about 3,000 words about the growth mindset, confidence, competence and imposter phenomenon. This is the culmination of thinking I’ve done about how to support myself and others to be more engaged and thoughtful about development and the things that stand in the way of growth. I presented some of these ideas at The IA Conference in 2019. Versions of these sentences were published on Medium in 2017. I quite often use the phrase ‘professional practice’, in contrast to ‘professional performance’. While I want those around me to ‘perform’ to a high standard, I want to suggest that most of what we do is actually practice. I rarely ‘perform’ these days. And I’m not even practicing so that one day I’ll be perfect. I don’t want to repeat the same tried and tested procedure over and over again, letter for letter, in every situation. The world is too volatile and unpredictable. When faced with a new challenge, and when we have the experience, we should measure the current situation to the templates we hold. Solutions that have worked in the past will be the first that we’ll try to apply now. But most of the time, taking a ready-made template to the types of problems I’m faced with isn’t the most effective or even the most efficient way of working. I improvise. I invent. I practice. But I probably think in these terms because I’m also trying to practice a ‘growth mindset’. Dr. Carol Dweck has contrasted two mindsets that we can hold in relation to skills and learning. A fixed mindset encourages a belief that intelligence is static. 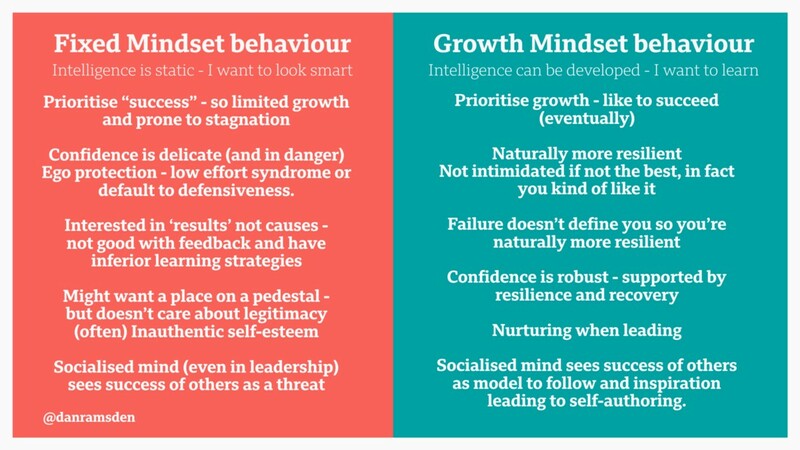 People who adopt a fixed mindset want to look smart — so they tend to prioritise success, limiting their opportunities for growth. The fixed mindset means that they see their behaviour and performance as integral to their personality — they don’t see much choice or autonomy in the way they do things. Their confidence can be delicate. They might engage in ego-protecting activities — employing “low effort” strategies so they can excuse failure. They might default into defensiveness during feedback. They’re more focused on ‘results’ not ‘causes’. So they don’t make the most of feedback and have limited learning strategies. They likely see the success of others as a threat. They like to succeed and probably want a place on a pedestal — after all, they’re focused on looking smart and successful. But they probably care less about the legitimacy of their position — they’ll happily accept undeserved praise. People operating using a ‘Growth mindset’ feel differently. For these people intelligence can be developed, so they want to learn. They like to succeed (eventually) but they’re more likely to prioritise growth and development. They tend to be more resilient. Their confidence is likely more robust, supported by this resilience and a fast recovery from setbacks. They see failure as providing useful information — it doesn’t define them. They’re not intimidated if they’re not the best — in fact they kind of like being surrounded by people to learn from. They see the success of others as a model to follow and inspiration to power their own development. As leaders, people with a growth mindset tend to be nurturing — they invest time in people. Whether we adopt a fixed or a growth mindset can have a profound effect on our ability to “perform” and practice professionally. Our mindset changes the meaning of effort for us. In a fixed mindset, effort most likely means that we’re not good enough. In a growth mindset effort can be energising. For those with a well-developed growth mindset, effort and ability are not mutually exclusive. Ask someone when they feel smart and someone with the growth mindset will answer “when I’m trying hard and getting better.” Someone with a fixed mindset will answer the same question, “when I make no mistakes.” The mindset that we adopt can have a profound impact. You might be reading this thinking that you’ve “got a fixed mindset”. Ironically, you’ll probably also be thinking that you can’t change it. But you don’t need mending — there’s nothing wrong with you — it might just be some of the behaviours that feel more natural. The labels we use are profoundly powerful. Labels shape our reality and underpin the mindset we hold. I’ve redrafted this piece several times to try to avoid labelling people — labels belong to behaviours. The mindsets are just a default set of beliefs that affect our behaviours. It’s hard to unpick these implicit beliefs and assumptions. But we can easily adopt some more helpful behaviours which in time can shift our mindset. Rewrite the ‘defining moments’ from the past — if there’s a key event that made you think you can’t do something, revisit the memory. Reinterpret and re-write what happened with a more ‘growth mindset’ filter. Detach the labels of failure from you personally to the behaviour or specific execution. Who inspires you? Find out the truth of their achievement. What ‘switches off’ your brain? Effort and failure can trigger flight or fight. Manage your ‘Amygdala hijacks’ to bring a more mindful, reflective state to moments of effort or failure. Our mindset underpins everything we do. It’s the lens that sits between us and the world. But we can control it. Think about the assumptions and beliefs that stand between you and the world. What mediates your experiences and filters your potential? Think of your mindset as an object, so that you can look at it rather than just through it. Think about the skills and behaviours that you need and value — and then practice them. But even with practice, sometimes even when we’re competent we can feel out of our depth. Lots of professionals, lots of the time, can feel like they don’t deserve to be where they are, doing what they do. Imposter syndrome can be crippling. Ironically it can compromise our ability to do our job and develop. It can also make us miserable. It makes life harder — personally and professionally. Imposter syndrome is tightly connected to how we think and feel about skills and knowledge. I’ve been comparing what I know about the imposter phenomenon with some of the ways I understand skills, learning and growth. It’s helped me to consider where imposter syndrome might begin. I think once you know the causes of these feelings, they feel more controllable and manageable. 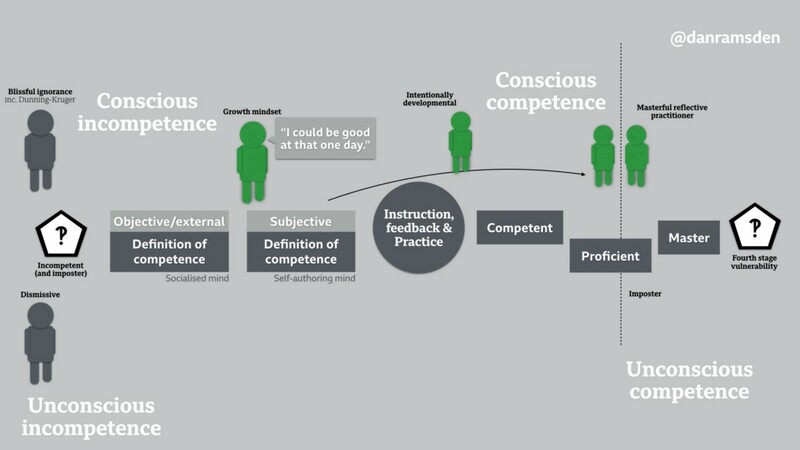 To start, I want to take a quick trip to the model of conscious and unconscious competence. It seems obvious that we can’t improve and develop skills until we’re aware that we don’t yet have them and that they’re important. Once we’ve acquired a skill or knowledge there’s usually a stage of grappling with it until we bring it under control. This stage of conscious effort is usually replaced with a less conscious execution as we move through proficiency towards mastery. This is how I think about how we develop competency — recognising the elements of craft and practicing. Robert Kegan has given me another model for thinking about the mind and our development. Kegan describes orders of consciousness — beginning at ‘The impulsive mind’ of children who become self-aware through to the ‘self-transforming mind’ capable of complex thought, reflection and action. Kegan describes three “minds” that we see and develop most-often in professional life. ‘The Socialised mind’ sees our meaning-making largely shaped by external sources. In professional life, those operating at this level are likely to be team players and faithful followers. They seek direction and work towards aligning activities with others and external expectations. They are reliant. At the next level of what Kegan labels ‘mental complexity’ is the ‘self-authoring mind.’ For the self-authoring mind your own internal thoughts shape meaning-making. You’re likely to be agenda-driven — having a clear sense of your own personal objectives. You have your own frame for situations and challenges. You provide your own direction. You’re much more independent. Kegan also describes the ‘self-transforming mind’ of those who move “from problem-solving to problem finding”. They’re able to hold contradictory and contrasting views at once and have a more sophisticated approach to leadership and action. I’ve started to think of imposter syndrome as just a type of fixed mindset. I’ve been using the Burch competency model and the work of Kegan and Dweck to explain my theory. When we begin in professional practice we’re (mainly) unconsciously incompetent. We’re incapable of objectively judging our competence because we’re unconscious of it. We could be blissfully ignorant of how incompetent we are — including those enjoying Dunning-Kruger effect. Or we might just not recognise the true value of the skills we lack. We’re unintentional in the way we relate to specific skills. 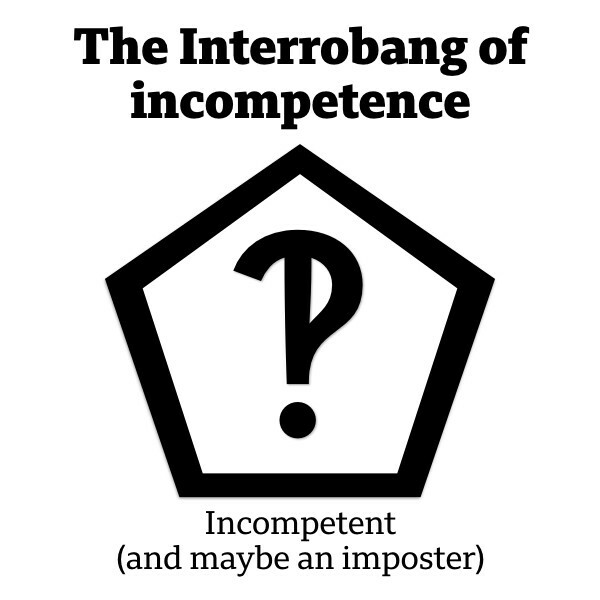 At some point we’ll smack into the Interrobang of incompetence. Something will make us aware of our incompetence. This might be accompanied by our first feelings of imposter syndrome. We might feel fear or guilt at finding out we’re incompetent. Or it might be a much more positive experience — depending on the development culture that surrounds us and our mindset. The culture and our mindset shape our response to any growth and development opportunity. They can create (at least) two tracks for us to follow when we discover we’re incompetent. Imagine using a growth mindset in this situation. Some event has provided objective and external evidence of your incompetence. At the same time you start to shape your own definition of competence. I think the way you translate the external definition that made you aware of your incompetence into a subjective, self-authored definition of competence will determine your relationship to the skill. A growth mindset will encourage you to take on the challenge of acquiring the competence. You’ll ‘author’ your own definition of what competence looks like. And it will be underpinned by a belief in practice over performance. You’ll have a healthy relationship to feedback and instruction. You’ll become intentional in your development of the competency, increasing your skill and hopefully moving towards a reflective practice that results in a high degree of proficiency or mastery. The key stage is the definition of competency. You consciously shape your (evolving) relationship to the skill or knowledge. You choose to acknowledge the gap, you become intentionally development, begin a conscious relationship with the skill and your growth mindset allows you to understand that this relationship will evolve. 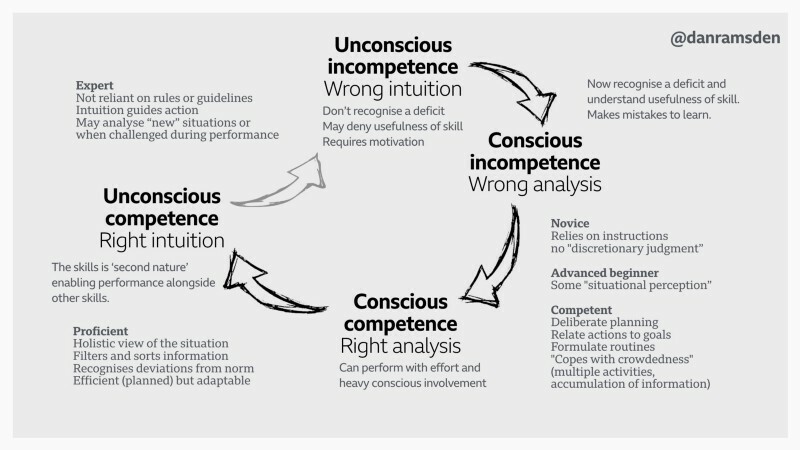 Unconscious competence does come with risks — because it’s less intentional. There’s a chance that you’ll fall into unconscious incompetence (through complacency). Or feelings of imposter syndrome might surface due to losing grip or confidence in your ‘definition of competence’ or your growth mindset. The similarity of this stage to the beginning of the process suggests the solution. Compare the external reality to an objective measure of competency. Adopt a more reflective practice. Revisit your definition of competency. Re-booting your intentionally developmental growth mindset should address both incompetence or imposterism. The growth mindset seems to hold the key to overcoming imposter syndrome. Let’s compare a fixed mindset approach to the same story. When someone in a ‘Fixed mindset’ hits the Interrobang of incompetence they have a more negative experience. The external evidence of incompetence is intensified by the belief that skills can’t be acquired or developed. They believe that if they can’t do it now, they’ll never be able to. They give up the development opportunity and don’t engage with the chance to grow. 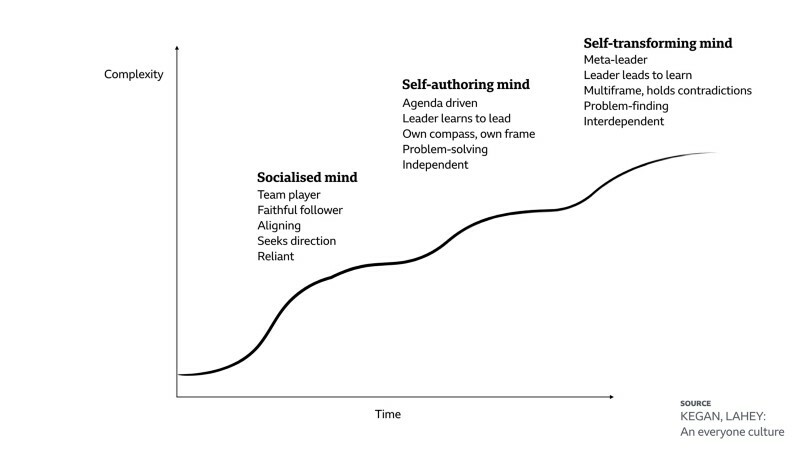 There might be another scenario where someone with an emerging or under-developed growth mindset — more influenced by the socialised mind — believe they can develop the skill, but not to the level of their colleagues. Their definition of competence also sets them up to fail — they’ll be unable to recognise their true competence. The only way to develop skill is through practice. The most effective form is conscious practice — leading to conscious competence. But the fixed mindset equates the effort of practice with an innate ‘inability’ rather than ability. Practice isn’t empowering in a fixed mindset. So even if they do ‘perform’ the skill repeatedly and acquire a level of proficiency, it will be a long and winding road. The repeated failures will only serve to reinforce the assumption of the fixed mindset. And if/when they do acquire the skill, they’re unlikely recognise their skill or associate it with ability or competency. Someone locked in a fixed mindset can become unconsciously competent — or unconfidently competent. Each time they become consciously aware of performing the skill (even if they do it well) their ‘fixed mindset’ equates the effort with incompetence and sparks imposterism. Unconfident competence is just another name for the imposter syndrome. It stems from becoming fixed to a faulty definition of competency — dismissing your ability or unfairly comparing yourself to others. Imposter syndrome strikes when we compare our inside to others’ outside. We know the effort that we spent in our practice and for our accomplishments. But it’s sometime hard to appreciate the effort that others are spending. And in a fixed mindset, effort undermines our confidence in our competency. Our mind and mindset affects our ability to form a healthy definition of competence and professional practice. If we adopt a growth mindset when the Interrobang of incompetence hits, we’re able to see an opportunity, not a threat. 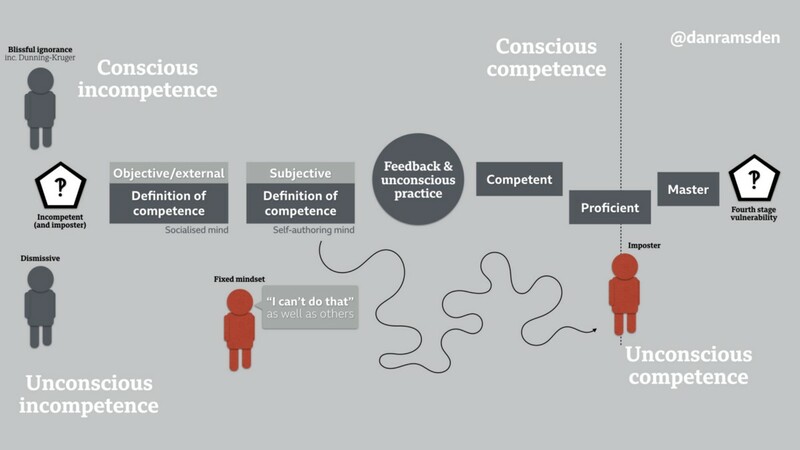 Maintaining a growth mindset as we shape a definition of competency sets us off on a path of instruction, feedback and intentional practice — the shortest route to competence. Telling ourselves that we can’t do something, or that we can’t do it as well as others will always lead to under-performance, a lack of competence and imposter feelings. Ultimately our definition of competence should be a firm conviction, loosely held — a trait of a self-transforming mind. We should be open to the idea that professional competency is like potential — it’s ever-expanding. Being confidently competent rests on a definition of competence that acknowledges that we’re always capable of growth. We’re never done. Competency is never finished. Development doesn’t end. I’d defended ‘confidence’ as the weapon to use against imposterism. Confidence enables the playful, non-reductive thinking that powers design. Confidence also enables and empowers curiosity. And curiosity is magic. While being overly-confident or arrogant is always bad, confidence is a positive attribute and a foundation on which to build your expertise and practice. When combined with curiosity, confidence becomes your weapon to work at every stage of competence. Information architects must be able to ask the stupid question. In truth, IAs need the confidence to understand that there are very few stupid questions. is fundamental to the practice of IA. That quote is actually taken from one of my favourite IAs — Abby Covert, on this podcast. I’ve written here about my ‘Spectrum of Intervention’ and described the ‘Fog of confusion’ and the ‘Roadblock of Unrecognised disagreement’. I seem to be going through a phase of grandiose naming, so inspired by Abby’s words I’m tempted to call the curve towards that zone ‘The Tyranny of Uh-huh’. A lack of confidence can keep us silent when we should speak up. “Stupid questions” are the quickest way to reveal the undermining assumptions that will damage our design. Asking questions can reveal a lack of knowledge but equally importantly they reveal assumptions. Revealing assumptions always helps to refine or clarify our design and intent. Revealing assumptions and architecting a shared reality is the main job of an IA. And because a well-timed “stupid question” is so useful, it’s the easiest way to disguise a lack of ‘competence in knowledge’ behind the high degree of confidence, skill and competence in question-asking. When deciding on the label of ‘unconfident competence’ as a way of exploring imposter syndrome, I’d assumed that ‘confident incompetence’ would be a bad thing. I’d described these people as living in blissful ignorance or enjoying the benefits of Dunning-Kruger effect while those around them suffered. But now I have a more positive framing for this state — curiosity. 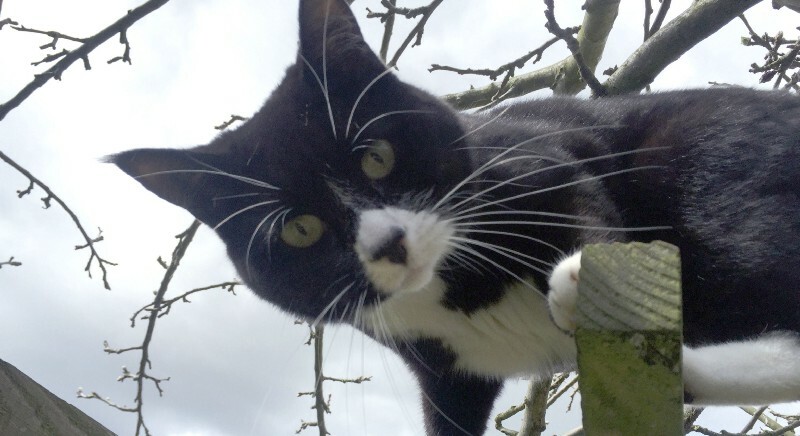 Curiosity might be frowned on in the cat community, but I think it’s the most vital element of the designer’s outlook. It’s hard to be scared when you’re curious. It’s difficult to sustain anger too. And likewise, it’s hard to be too confident when curious. Curiosity seems to calibrate confidence to just the right amount. Curiosity isn’t obsessive, dogmatic or entrenched. It embraces possibility and then provides the motivation and energy to pursue it. Curiosity is our friend. So, next time you think you understand what someone just said, make sure. The next time you’re sat in a room and someone says “uh huh,” ask the stupid question for them — they’ll likely be thankful. And the next time you think you might be incompetent, stay curious, ask yourself what a competent person might do in this situation and then try doing it.